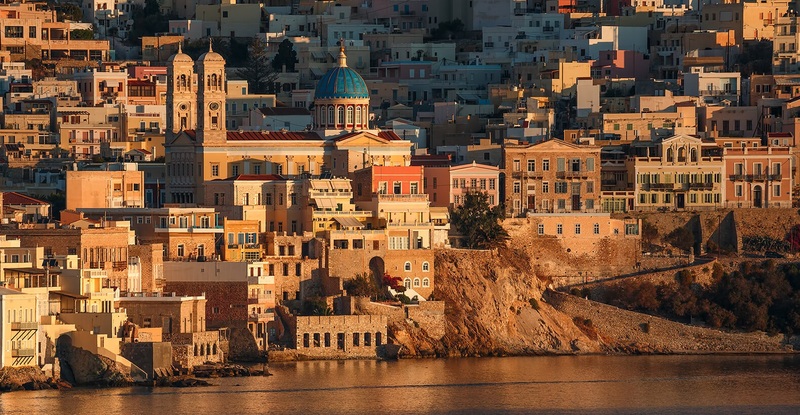 A simply beautiful island filled with vibrant culture, fascinating architecture and gorgeous sandy beaches, Syros offers a truly authentic Greek experience. Out of all the islands that make up the Cyclades, Syros is commonly thought of as the one which truly exhibits the “real Greece”, where tourist influences have not taken over and where visitors can fully embrace the Greek lifestyle. Although the island has been relatively uncompromised by tourism it still remains very popular for visitors seeking a tranquil and enjoyable vacation where endless summer days can be spent strolling through the winding streets, enjoying delicious traditional cuisine at one of the many waterside cafes and tavernas or lazing on a beautiful uncrowded beach listening to the waves lap around them. If you can stand to drag yourself away from the stunning vistas and sumptuous surroundings of your private villa there are numerous things to do here including exploring the colourful port town of Hermoupolis, the capital of the Cyclades. Museums, ancient churches, archaeological sites, windy streets, electric atmosphere and beautiful warm sunshine…this really is Greece!